A tweet from the British Library medieval manuscripts account drew my attention to five damaged leaves in a British Library manuscript, Additional 40165 A. They are portions of Cyprian’s Letters, letters 55, 74 and 79. This is CLA II 178. What makes them exciting is the early date – 4th century, according to the BL twitter account (the online page does not give a date) – and the location, which is North Africa. The Trismegistos site gives the date as 375-400 AD, and location as Europe or North Africa. 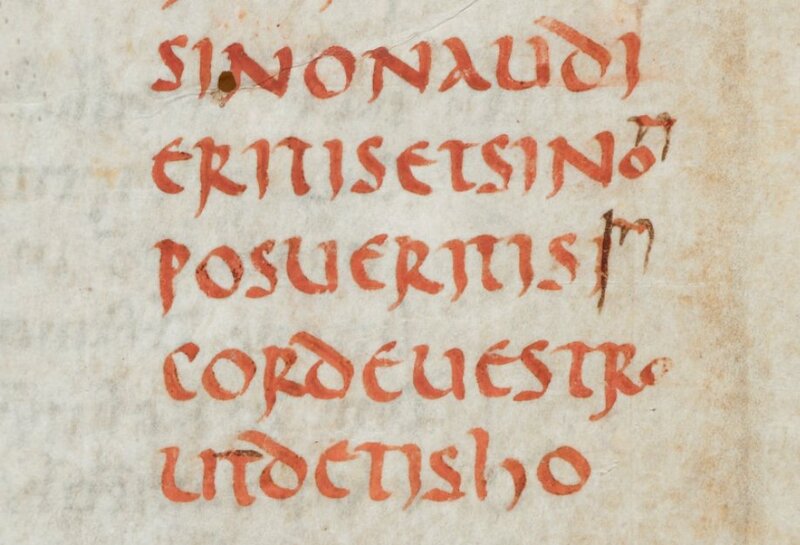 Three fragments from St Cyprian’s epistles:. 3. Epistle LXIX: ‘aepiscopo legitima’ (p. 752, 1. 11) – ‘episco[po] alium sibi’ (p. 754, 1. 17) (f. 5r). (References [to pages.lines] in Corpus Scriptorum Ecclesiasticorum Latinorum, Vol 3, Part 2). 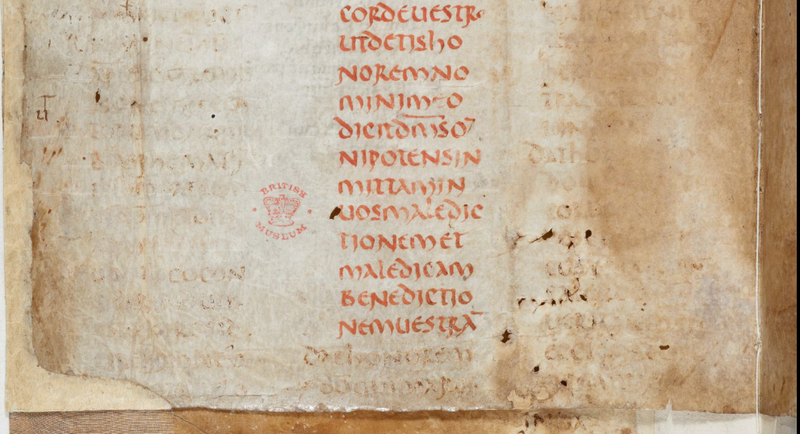 The manuscript of which these fragments formed part, appears to have been the archetype, (at least in these three letters) of the English group of manuscripts (classed by von Soden, 1904) as ‘n’, which includes Royal MS 6 B XV, Oxford, Bodley Latin MS 210, New College MS 130, and Cambridge, Corpus Christi College MS 25. Decoration: Biblical quotations in red. 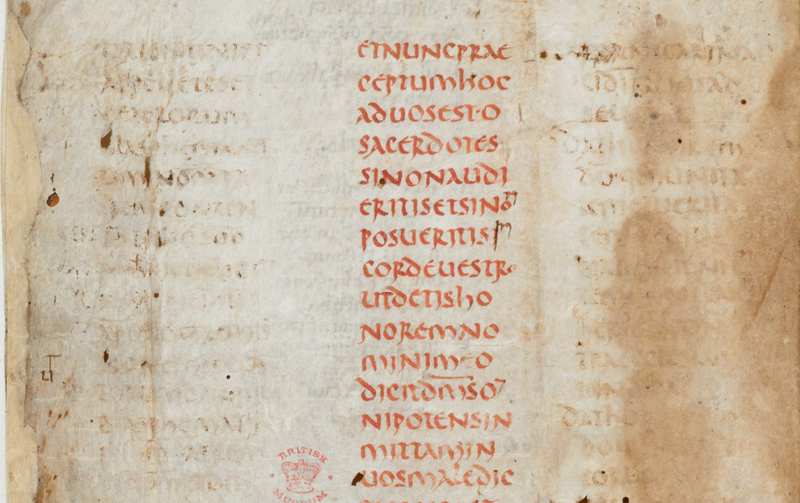 Provenance of all parts : Used as flyleaves for a 12th-century Latin manuscript, now Additional 40165B: a table of contents of this manuscript in a hand of the 13th century covers an erased portion of the text (f. 3r).Bernard Howard, 12th Duke of Norfolk (b. 1765, d.1842): his bookplate in Additional 40165B.Purchased by the British Museum (with Additional 40165B) in the anonymous sale of manuscripts at Sotheby’s on 20th December 1921, lot 504, for £40. Purchased by the British Museum (with Additional 40165B) in the anonymous sale of manuscripts at Sotheby’s on 20th December 1921, lot 504, for £40. The pages were cut-down and used as fly-leaves in the binding of a 12th century manuscript, which is how they survive. Here’s the full leaf (3v), the bible stuff is the middle column. It is unclear whether we can see paleographical evidence for origins in Roman North Africa. The pages have been trimmed, but Bévenot states that the original pages were written in four thin columns; very unusual, and a hang-over from the usage in the papyrus roll. Rod Letchford has created a new website dedicated to Cyprian. It’s http://cyprianproject.info/. At the moment it’s a collection of links, but no doubt will grow!